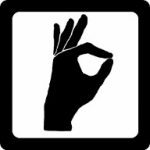 This course is an introduction to the fascinating world of communicating in BSL – British Sign Language. It covers fingerspelling, greetings, asking and answering questions, colours and more, including the weather (well, it is British sign language). There are videos for you to watch, reference sheets to remind you of the signs, printables to help you practise and online quizzes to help you check your understanding. Each lesson has a video showing the vocabulary and concepts which you will learn. Each video starts with BSL only; this is then followed, after the logo, by the same message in BSL with subtitles. As BSL has a different grammar to English you may be surprised by the subtitles; they are a direct translation of the new signs and not an English translation of the message. As you work through the lessons, do take the time to practise forming the signs yourself. At the end of each lesson there is a short quiz to test your understanding. At the end of the course there is a ‘superquiz’ covering all the topics which you have learnt. The estimated guided learning time for this course is 3 hours; this does not include personal practice time.